kDepartment of Neuroradiology (B.L. ), Erasme University Hospital, Brussels, Belgium. BACKGROUND AND PURPOSE: Use of the WEB intra-aneurysmal flow-disruption device in unruptured wide-neck bifurcation aneurysms has proven safety and efficacy. However, ruptured aneurysms are underrepresented in existing studies. This retrospective multicenter study describes the use of the WEB in patients with a ruptured intracranial aneurysm. MATERIALS AND METHODS: Ten centers contributed to this study. Clinical and procedural data of 47 patients with 52 aneurysms were analyzed retrospectively together with follow-up angiographies. RESULTS: There were 37 anterior and 15 posterior circulation aneurysms with a neck size of ≥4 mm in 49 of 52 (94%) aneurysms; 45 (87%) aneurysms were <10 mm, and 2 were partially thrombosed. Successful placement of the WEB was possible in every case. Adjunctive devices were used in 8 of 52 (15%) aneurysms. Thromboembolic events were observed in 4 of 52 (8%) patients. Adverse events occurred in 15 patients with 16 aneurysms, 9 of which were potentially related to the WEB procedure (3 thromboembolic events, 5 protrusions, and 1 perforations; 2 perforations were caused by the wire or catheter), but none had a clinical impact. Four patients were retreated. Short-term follow-up in 25 of 39 patients revealed complete occlusion in 15 of 25 (60%), 5 of 25 (20%) with residual neck, and 5 of 25 (20%) with residual aneurysm filling. Short- to midterm imaging in 9 of 25 patients revealed complete occlusion in 5 (55.6%), residual neck in 2 (22%), and residual aneurysm filling in 2 (22%). Of 47 patients, 23 (49%) had an mRS score of 0, 1, or 2; 13 (28%) had an mRS score of 3 or 4; and none had an mRS score of 5 at discharge. CONCLUSIONS: This retrospective series showed good procedural safety, feasibility, and stability of midterm occlusion in ruptured wide-neck bifurcation aneurysms. The WEB aneurysm embolization system (WEB; Sequent Medical, Aliso Viejo, California) is a self-expanding microbraid mesh implant delivered through a microcatheter and sized to fit and occlude an aneurysm in a single step. Two versions are available: a dual-layer type (WEB-DL), which is composed of 2 concentric cages, and a single-layer type (WEB-SL or SLS). The available sizes range from 4 to 11 mm in diameter and 3 to 9 mm in height. The mesh is designed to disrupt the flow at the neck of the aneurysm and to ultimately exclude it from the blood flow while preserving the flow in the parent artery (Fig 1). It seems to be especially suitable for broad-based bifurcation aneurysms and may eliminate the need for other reconstructive measures inside the parent artery, such as placing a stent.12 Numerous publications have described the successful use of the WEB in the treatment of unruptured wide-neck bifurcation aneurysms.12⇓–14 Just recently, a single-center experience with the WEB in 6 ruptured aneurysms was reported, and the results were promising.15 In this retrospective multicenter case series, we describe use of the WEB in 52 aneurysms in 47 patients who presented with subarachnoid hemorrhage secondary to a ruptured intracranial aneurysm. A, WEB-DL, a double-layer microbraid, used in 37 of the 52 aneurysms in this series. B, WEB-SL, a single-layer implant, used in 15 of the 52 aneurysms in this series. A retrospective review of the medical records, radiographic imaging, and interventional reports was performed for 47 patients treated with a WEB device for a ruptured intracranial aneurysm at 1 of 10 European centers between May 2011 and December 2013. At each participating center, clinical and interventional treatment was provided per institutional standards of care. In each participating institution, the indication for treatment and technique (surgery or endovascular treatment) were decided on a case-by-case basis by a local multidisciplinary team that included neurosurgeons, neuroanesthesiologists, neurologists, and neuroradiologists. 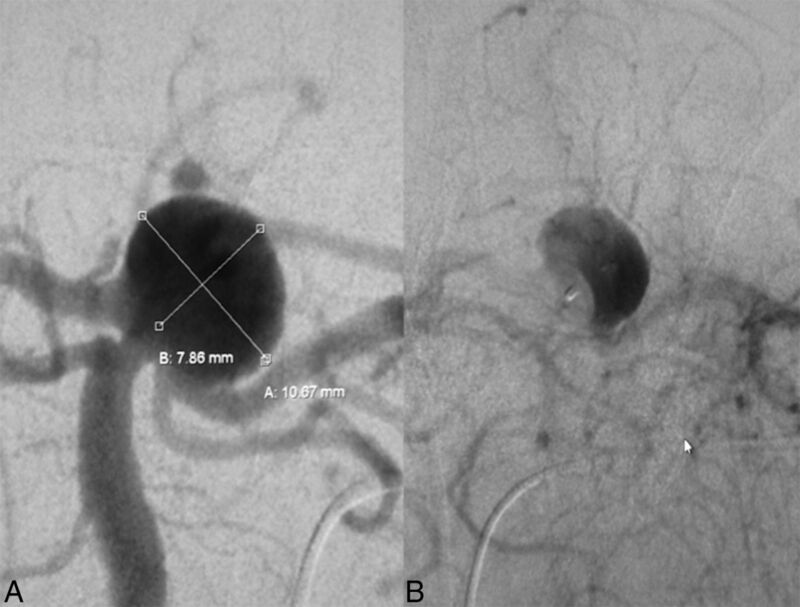 The selection of aneurysms treated with the WEB device was performed autonomously in each center by the interventional neuroradiologists according to aneurysm characteristics (ie, location, diameter, and neck size). Permission from each patient to include their data was achieved in accordance to institutional ethical guidelines. Baseline patient and aneurysm characteristics, comorbidities, and SAH severity scores (Hunt and Hess [HH] or World Federation of Neurosurgical Societies classification) were compiled. Angiographic assessments were made at baseline, immediate postembolization, short-term (2–9 months [mean, 4.2 months]), and midterm (7–25 months [mean, 12.9 months]) time points. The immediate periprocedural hemodynamic effects and follow-up occlusion success were rated and reported by each operator as “complete,” “residual filling of the neck,” or “residual aneurysm filling,” as previously described.15 Periprocedural medications, procedural complications, and clinical outcomes were compiled. Forty-seven patients harboring a total of 52 aneurysms were evaluated. SAH severity scores (HH or World Federation of Neurosurgical Societies) were available for 46 of the 47 patients. Eleven patients had an HH grade of I, 12 had an HH grade of II, 8 had an HH grade of III, 7 had an HH grade of IV, and 5 had an HH grade of V. The median HH score was II. Three patients were rated according to the World Federation of Neurosurgical Societies system; 2 patients had a grade of 1, and 1 patient had a grade of 5. Three patients had 1 additional aneurysm, and 1 patient had 2 additional aneurysms. These aneurysms were treated during the same procedure with WEB devices. The anatomic locations of the ruptured aneurysms were distributed as follows: 18 in the MCA, 17 in the anterior communicating artery, 8 in the basilar artery, 6 in the posterior communicating artery, 1 in the ICA terminus, 1 in the PICA, and 1 in the pericallosal artery. In the 4 patients with multiple aneurysms treated (9 aneurysms total; 1 patient with 2 in the MCA and 1 in the PICA, 1 patient with 1 in the ICA terminus and posterior communicating artery, and 2 patients with 1 in the MCA and anterior communicating artery), the rupture site could not be identified with absolute certainty, and each aneurysm was treated with a WEB device. The rupture site was visible in 32 aneurysms, and in 10 it interfered with deployment of the WEB. Two of these patients were among those with periprocedural rehemorrhage, one that resulted from a microwire perforation and the other that potentially resulted from the WEB deployment itself. Of 52 aneurysms, 10 (19.2%) were <5 mm in diameter, 35 (67.3%) were 5–10 mm in diameter, and 7 (13.5%) were >10 mm in diameter. Of the 52 aneurysms, 49 (94.2%) had a neck size of ≥4 mm (mean, 4.7 mm). Two of the large aneurysms were partially thrombosed. Two treatments were performed as one staged procedure; one required additional coiling of a remnant during a control angiogram within 24 hours, and the other was planned as a 2-step occlusion, first of the dome, including the rupture site, followed 4 days later by stent-assisted coil occlusion with reconstruction of the neck under dual antiplatelet medication. For 34 of the aneurysms, the index procedure was performed with the patient having been given a full bolus of IV heparin (5000 IU); 9 aneurysms were treated with a reduced bolus (2500 IU, all in the same center); and 9 were treated without heparin. Heparin was maintained at partial thromboplastin time levels of 40–50 seconds for 48 hours in 5 patients from one center. Low-molecular-weight heparin was maintained in 22 patients (21 from 1 center). Only 1 patient was known to be on aspirin before the treatment. Twenty-three patients received 250–500 mg of aspirin during the intervention, usually before introduction of the WEB device. Glycoprotein IIb/IIIa inhibitors were used to counteract periprocedural thrombus formation: eptifibatide (Integrilin) in 2 cases of visible clot and abciximab (ReoPro) in 1 case of WEB protrusion. Postprocedural antiaggregation was maintained continuously in 27 patients (75–100 mg aspirin/day), and 7 of 27 received additional clopidogrel (75 mg/day) for 12 weeks. Eight patients who were kept on posttreatment antiplatelet medication were among those who had either periprocedural thrombus formation or postapplication protrusion of the WEB as the reason to keep up the medication. Another 19 patients were kept on a single antiplatelet medication without evident procedural reason (per the institutional standard of care). One patient with a periprocedural clot formation was treated with mechanical clot extraction by means of a Solitaire stent (Covidien, Irvine, California) and was administered a single 500-mg dose of aspirin, but no continuous medication was given. Most procedures were performed with 6F access catheters/long sheaths, and 17 of 52 aneurysms were treated with intermediate catheters in addition to the dedicated microcatheters (32 VIA or VIA PLUS [Sequent Medical], 20 other catheters of ≥0.027 inches). Thirty-seven aneurysms were treated with a dual-layer device that was composed of 2 cages of 144 woven nitinol strands, and 15 aneurysms were treated with single-layer devices in which the number of nitinol strands varied from 144 to 216 (on the basis of device diameter). Eight aneurysms were treated with additional devices (4 with stent only, 1 with coils only, 1 with coils and a stent, 1 with coils and a balloon, 1 with a balloon). The reasons for adjunctive treatments were planned staged procedure (1 case), to complete neck closure or sac filling (2 cases), to treat preaneurysm stenosis (1 case), and to correct device protrusion (4 cases). Treatment durations ranged from 15 to 193 minutes (average, 68 minutes). Treatment durations for 4 of the treatments with WEB placement in multiple aneurysms ranged from 67 to 195 minutes. Periprocedural adverse events were reported for 15 patients during the treatment of 16 aneurysms, including 1 patient with 2 complications. Among those who underwent these procedures, 10 patients had no clinical sequelae and were discharged with an mRS score of <2 or a score equal to that before the initial SAH (Table 1). Thirty-six aneurysms were treated without adverse events. In a maximum of 12 of 16 complicated treatments, the adverse event could possibly be attributed to the actual delivery of the WEB device. However, 3 of those were caused by the guidewire (1 perforation) or the microcatheter probing (1 perforation and 1 induced spasm). Four events were thromboembolic in nature and required antiplatelet medication; 1 received eptifibatide, 1 received eptifibatide and additional aspirin and clopidogrel, 1 clot progressed despite 500 mg of intravenous aspirin and was removed successfully with a Solitaire stent, and in 1 case there was no information with regard to treatment. None of these patients had clinical sequelae. Four aneurysms exhibited angiographic protrusion of the WEB that necessitated the use of a stent and, in 1 case, the additional use of IV antiplatelet drugs. Three aneurysms were perforated during the treatment. However, only 1 case presented evidence of an additional SAH on postprocedural CT. This SAH might have occurred during the deployment of the device itself, and there was no clinical impact on the patient. The other 2 perforations were caused by a wire or a catheter. There was no delayed bleeding in any of the patients treated with a WEB device. An immediate postprocedural hemodynamic effect was achieved in 44 of 52 (84.6%) aneurysms. Twenty (38.5%) aneurysms were completely occluded, 15 (28.8%) only showed contrast in the proximal compartment of the implant, and another 9 (17.3%) showed at least occlusion of the aneurysm dome beyond the implant. In 1 patient, a coil was also used within 24 hours to occlude an angiographic remnant outside the WEB that was not covered by the WEB itself after its initial placement. Of the 8 aneurysms that did not even partially occlude, 6 at least showed delay of the contrast washout until the venous phase, 1 even after the venous phase. Imaging performed in 25 of 39 patients still alive at short-term follow-up (mean, 4 months [range, 2–9 months]; 21 performed with DSA, 4 performed with MRA) revealed complete occlusion of the aneurysm in 15 of 25 (60%) cases, 5 of 25 (20%) had residual filling of the neck, and 5 of 25 (20%) showed residual filling of the aneurysm. Imaging performed on 9 of 25 patients at midterm (mean, 13 months [range, 7–36 months]; all DSA) revealed complete occlusion of the aneurysm in 5 of 9 (55.6%) cases, 2 of 9 (22.2%) had residual neck, and 2 of 9 (22.2%) had residual aneurysm filling. In the midterm follow-ups, none of the implants themselves showed filling with contrast. There was no conceivable difference between the single- and dual-layer implants. Among the 20 aneurysms with immediate complete occlusion, 12 were treated with a dual-layer device, and 8 were treated with a single-layer device. None of the aneurysms that exhibited residual filling of the sac on midterm follow-up had been treated with a single-layer WEB. Four patients required endovascular retreatment. In 1 patient, DSA was performed because of neurologic worsening on the day of the initial treatment; it was decided to treat this residual aneurysm with coils. One patient required endovascular retreatment with coils 1 month after the initial procedure. One patient had 3 aneurysms treated with a WEB device initially, and additional endovascular treatment was required because of a dissecting V4 aneurysm with coils and Y-stent placement 3 weeks later. One patient required retreatment with coils and a stent 3 months later for aneurysm regrowth caused by integration of the WEB into an intra-aneurysmal thrombus. All remnants or recurrences were treated by endovascular means without additional adverse events. Of 47 patients, 23 were discharged as independent survivors with an mRS score of 0, 1, or 2; 13 patients had an mRS score of 3 or 4; and none had an mRS score of 5. Eight patients died during their hospital stay, 5 as a result of the SAH and 3 for other reasons (1 from rehemorrhage 3 hours after treatment, probably as a result of dissection from another aneurysm; 1 from acute respiratory distress syndrome; and 1 from vasospasm and infarction of all territories). For 3 patients, the postprocedural mRS score was not recorded. Nineteen patients experienced a complication during their hospital stay. Of these 19 complications, 16 were related to the initial SAH (eg, vasospasm, new infarction on follow-up imaging, or ventriculitis after insertion of an extraventricular drainage). Three patients experienced postprocedural hemorrhage during their hospital stay: 1 intraparenchymal hemorrhage resulted from external ventricular drainage, 1 aneurysm was insufficiently occluded and was coiled within 24 hours after clinical worsening of the patient, which may have been caused by rehemorrhage, and 1 patient experienced rupture of an additional aneurysm 3 hours after the treatment of the index aneurysm with a WEB. This rupture was of a dissecting aneurysm that was treated with coils but had a fatal outcome. The dissecting aneurysm was identified as the source of rehemorrhage by autopsy. Of 16 complications that were reportedly related to the intraoperative device and/or the procedure, 9 occurred in patients who were discharged with an mRS score of >2; one of these 9 patients already had a pretreatment mRS score of 3 and was discharged unchanged. Two of these 9 patients died, one of whom had a guidewire perforation during the treatment; 5 of 9 had an mRS score of 3 or 4, and no information was available for the other 2 patients. Of the 30 patients available for midterm follow-up, 27 were independent. Of the remaining 3, two had maintained their initial status, and 1 had progressed from an mRS score of 1 at discharge to an mRS score of 4 after an episode of intraparenchymal hemorrhage after tPA administration for pulmonary artery thrombosis (Table 2). Ruptured basilar tip aneurysm before (A) and immediately after (B) deployment of the WEB device. After the WEB is placed, no contrast filling can be seen inside the dome, including the bleb that is presumed to be the rupture site; furthermore, there is stasis of contrast inside the WEB beyond the venous phase, indicating sufficient hemodynamic decoupling. Recently, a multicenter study by Papagiannaki et al20 of 87 aneurysms (mostly unruptured) in 85 patients was published, and the results were favorable for the WEB when compared with those of coil occlusion in the Analysis of Treatment by Endovascular Approach of Nonruptured Aneurysms (ATENA) trial and the Clinical and Anatomical Results In the Treatment of Ruptured Intracranial Aneurysms (CLARITY) study.21,22 Although the percentage of broad-based aneurysms was much higher in the Papagiannaki et al series (85.9% vs 9.1% in CLARITY), the results for peri-interventional rupture and thromboembolic events were comparably low, and the rate of adequate occlusion was even higher with WEB than in CLARITY. Despite these observations, there is still a lack of evidence regarding the treatment results for WEB in ruptured aneurysms so far; in the Papagiannaki et al study, only 4 aneurysms (4.6%) were ruptured. In the present series of 52 ruptured aneurysms, the technical success was 100%. However, failed attempts to place a WEB device or even the catheter and the subsequent choice of other treatment algorithms were not specifically recorded. A limitation of this novel implant, which can be attributed to the larger microcatheter needed and greater rigidity during the initial delivery when compared with those of coils, is the fact that in 10 of 52 aneurysms, the operator felt that the implant interfered with the rupture site during its delivery. However, only in one such case could a periprocedural rupture (seen as an increase in the extent of subarachnoid blood on postprocedural CT) potentially have been attributed to the WEB delivery and was of no clinical consequence whatsoever (patient with an mRS score of 0 on follow-up). Two other complications included microguidewire and microcatheter perforations, which occurred before each implant was advanced. Because of the nature of subarachnoid hemorrhage, the overall clinical outcome in our series was worse than that in the Papagiannaki et al series. Eight patients died during hospitalization, and another 11 patients experienced SAH-related complications such as severe vasospasm leading to infarction or ventriculitis after external ventricular drainage. However, after the acute phase, the results were relatively good. Of the 30 patients available for midterm follow-up, 27 were independent survivors (mRS scores, 0–2). Of the remaining 3 patients, 2 have remained at their pretreatment status, and only 1 had progressed from an mRS score of 1 at discharge to an mRS score of 4 after an episode of intracranial hemorrhage after tPA administration for pulmonary artery thrombosis 7 months after the index procedure. Most important is that there was no late rerupture or late ischemia that could have been attributed to the WEB. All rehemorrhages occurred during the acute or subacute phase and could be explained by either periprocedural perforation with the wire or the catheter/WEB or incomplete occlusion of the aneurysm, leaving the potential rupture site unprotected by the implant. The midterm occlusion rates compare favorably to those of other series of ruptured aneurysms, such as CLARITY. Here, adequate occlusion was observed in 419 of 517 (81.0%) aneurysms, and an aneurysm remnant was found in 98 of 517 (19.0%) aneurysms at midterm follow-up. In our series, only 4 aneurysms required additional treatment. One was a dissecting PICA vertebral aneurysm, initially misjudged as a PICA aneurysm and later treated with an additional stent and coils. Another procedure was staged with a WEB in the acute phase followed by surgical clipping. The remaining 2 aneurysms were a residual filling at the neck at 1 month treated with coils and regrowth of a partially thrombosed aneurysm that had been treated with 2 WEB devices, which both became integrated into the clot. The recurrence was treated with a stent and coils. Furthermore, the results of our series cannot really be compared with those of CLARITY, because 49 of the 52 ruptured aneurysms in our study had a neck size of ≥4 mm versus the only 9.1% broad-based ruptured aneurysms in CLARITY. Between the 2 different types of WEB devices (single- or dual-layer), not many differences could be found. First, because of the later introduction of the WEB-SL, all treatments before June 2013 were performed with the WEB-DL. Thus, only 15 aneurysms were treated with a single-layer device. With the introduction of the single-layer WEB, the question of whether it would be similarly effective in flow disruption arose. In our series, we could not find a difference in efficacy between the 2 designs, neither with regard to the immediate angiographic result nor to long-term occlusion. The absolute numbers were actually in favor of the single-layer WEB device. Immediate complete occlusion was recorded for 12 of 37 WEB-DL and 8 of 15 WEB-SL devices. None of the aneurysms with residual filling of the sac on midterm follow-up was treated with a single-layer WEB. We interpret this trend as an indication that the flow-disrupting effect of the single-layer system most likely is at least as good as that with the dual-layer WEB; this, however, remains to be proved in a larger comparative study. The WEB intra-aneurysmal flow disruptor can be used in ruptured aneurysms with safety and efficacy equal to those shown in previous experiences gathered with use of the WEB device in nonruptured aneurysms. Comparison with previous series of ruptured aneurysms was compromised by the fact that in most cases in our series, the aneurysms were broad-based. This specific geometry in combination with acute rupture renders the rate of necessary retreatments favorably in comparison with that of most series of coil occlusion. Partial thrombosis is still an unsolved issue, because the WEB may become integrated into a clot over time. The single-layer version performed as well as the dual-layer device in our series, with absolute numbers in favor of the WEB-SL, particularly with regard to thromboembolism. Protrusion of the implant is a potential problem that more likely may occur in small and shallow aneurysms, which is a limitation that will probably be overcome with an enhanced-visibility version of the braid and new angiographic imaging modalities. Overall, the WEB seems to be a very suitable treatment option for ruptured aneurysms, even if they are broad-based. Concerns that the conceptual differences between the WEB device and coil occlusion may be associated with an increased risk of rehemorrhage are not warranted by the results of this series. Disclosures: Thomas Liebig—UNRELATED: Consultancy: Consulting and proctoring for Sequent Medical, Acandis, MicroVention, Concentric/Stryker, and eV3. Ansgar Berlis—RELATED: Consulting Fee or Honorarium: Consultancy and proctoring agreements with Sequent Medical; UNRELATED: Payment for Lectures (including service on speakers bureaus): Penumbra and Stryker. Werner Weber—RELATED: Fees for Participation in Review Activities such as Data Monitoring Boards, Statistical Analysis, Endpoint Committees, and the Like: WEB CAST study*; UNRELATED: Consultancy: Proctor for WEB cases in other institutions. Laurent Pierot—RELATED: Consulting Fee or Honorarium: Sequent Medical; UNRELATED: Consultancy: Codman, Covidien/eV3, MicroVention, and Stryker. Tufail Patankar—UNRELATED: Other: Proctor for WEB device. Xavier Barreau—RELATED: Fees for Participation in Review Activities such as Data Monitoring Boards, Statistical Analysis, Endpoint Committees, and the Like: Sequent Medical*; UNRELATED: Consultancy: Sequent Medical. James Dervin—RELATED: Support for Travel to Meetings for the Study or Other Purposes: Sequent Medical, Comments: WEB training course in Magdeburg, Germany, April 2013, travel and accommodation paid by Sequent Medical; UNRELATED: Consultancy: Sela Medical, Comments: Proctor Sela Medical £1300, January 2013; Travel/Accommodations/Meeting Expenses Unrelated to Activities Listed: Covidien and Sela Medical, Comments: Travel and accommodation and registration for the following meetings from Covidien: LINC meeting, Paris, June 2013; ESMINT meeting, Nice, France, September 2014; ALICE meeting, Essen, Germany, May 2012; and Neurovascular course, Tel Aviv, December 2013. Boris Lubicz—UNRELATED: Consultancy: MicroVention and Codman. Joachim Klisch—UNRELATED: Consultancy: Sequent Medical. * *Money paid to the institution. Accepted after revision February 2, 2015.